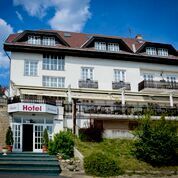 We are waiting for your arrival in a calm, peaceful environment on the Széchenyi Hill located in the XII. district (Rácz Aladár street 45.). Our establishment is a 3 star hotel. From most of our rooms you can enjoy the fantastic panorama of Budapest. You can start your day with a lavish breakfast buffet while you are admiring the view of our capital. This is a small hotel with a familiar atmosphere where we deal with our guests individually. The Budai Hotel is an ideal option for those who do not like big, impersonal places. We have double and single bed rooms and we can also provide our guests with extra-beds if necessary. We have altogether 13 rooms with 41 normal + 9 extra beds, so our hotel is an ideal place for families, friends, small groups or business travelers. Our rooms are equipped with free internet access (WiFi), television sets (with both Hungarian and International TV channels), refrigerators and desks with chairs. All our rooms are en-suit. We also provide bed linen, towels, wardrobes and if needed, we can also provide hairdryers, flat-irons and ironing-boards. Our guests can park their cars in front of the hotel which is free of charge, or they can use our closed and roofed parking lot (max. 4 cars) for a fee. Our visitors can relax in our coffee-room and drink bar where they can try out different coffee drinks, beers, wines and spirits. (also non-alcoholic drinks for kids) If our guests are looking for a bit of relaxation, they can play a game of billiards, table football, darts or badminton. We also have a spacious hall where all our guests can be together. At the reception desk the visitors can buy tickets for various programs in Budapest. Payment options: cash (Forint, Euro); credit card; money transfer. We have three conference rooms that are suitable for weddings, business meetings, birthdays and parties. The downtown of Budapest is 5.9 km away from the hotel. It takes approximately 14 minutes to get to the city center by car; it takes approximately 30 minutes by public transport. 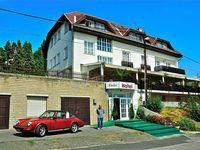 • Garage is available for guests at 9 EUR per car per day.